My daughter’s favorite sandwich is a Reuben so I usually have the ingredients for them on hand. 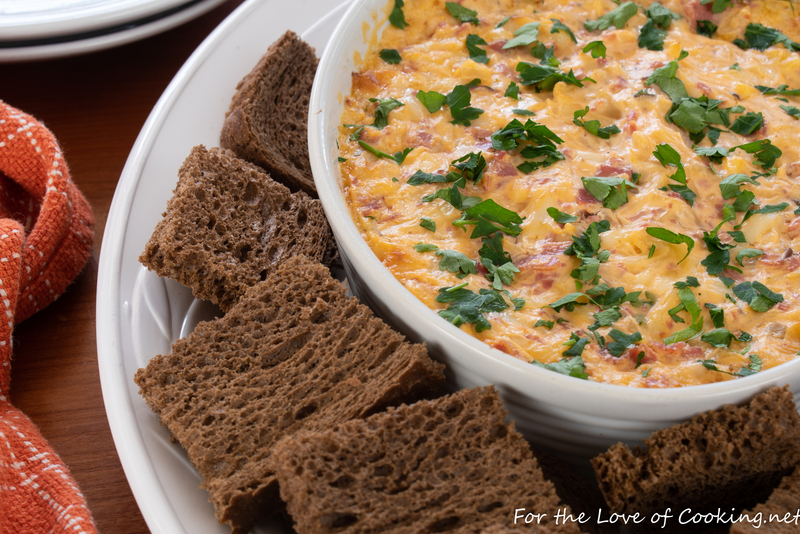 I stumbled upon a recipe on Cooking and Beer for a Reuben dip with dark rye crostini that I knew my daughter would love, and since she was home sick, I decided to surprise her with this dip for lunch. My daughter loved it and devoured nearly all of the rye crostini and most of the dip. Preheat the oven to 350 degrees. Coat a small baking dish with cooking spray. Line a baking sheet with parchment paper. Place the cut dark rye bread pieces on the baking sheet. Place into the oven and bake for 5-7 minutes, or until crisp. Remove from the oven; set aside. Combine the cream cheese, sour cream, mayonnaise, ketchup, and relish together in a large bowl; mix until creamy and well combined. Add the Swiss cheese, Pastrami, sauerkraut, Gruyere, and fresh parsley; mix until well combined. Pour into prepared baking dish. Place into the oven and bake for 15-20 minutes, or until bubbly. Serve immediately with dark rye crostini. Enjoy.